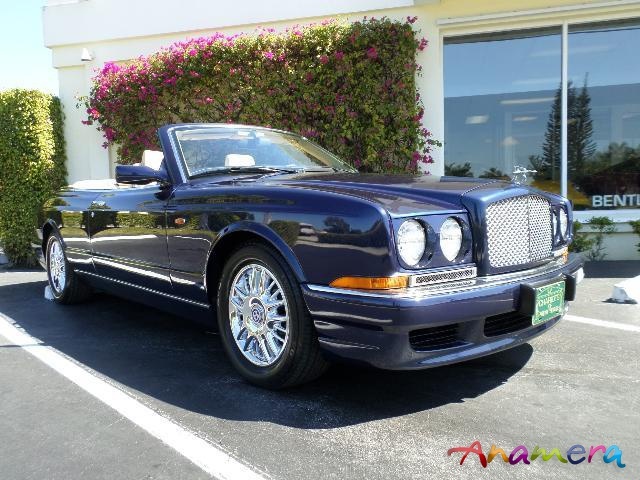 *** ONLY 37,671 MILES *** BENTLEY AZURE! JUST SERVICED AT LOCAL BENTLEY SPECIALIST! METICULOUSLY MAINTAINED WITH SERVICE HISTORY! VENEERED DOOR PANELS! LAMBS WOOL RUGS! TWO-TONE STEERING WHEEL! CHROME GRILLE! AVON TIRES! CARFAX CERTIFIED! Finished in Peacock Blue Metallic with Magnolia main hides and Blue secondary hides. Stunning Blue soft-top. Burr Oak Veneers interior trim.. Dash-roll in blue and knee-roll in magnolia. Two-tone hide trimmed steering wheel and wood trimmed gear shifter. Lamb wool rugs in blue. 17” Factory Chrome wheels. One of the few convertibles with comfortable rear seating for two large adults. * Two-Tone Hide Steering Wheel. * Veneered Surround to Seat Switches. * Lambs Wool Rugs in Blue. * Solid Wood Gear Lever. * Embroidered Bentley Emblems to Head Restraints. * Veneered Panels to Doors. All Books. Includes 2 Bentley Umbrellas, battery tender and Bentley tool-kit. All Original. Non-Smoker. CARFAX Certified. Superb! We are export specialists and proven experts in shipping vehicles worldwide. For additional details, reference letters, and to view our inventory of over 90 luxury certified vehicles, please go to www.chariotsofpb.com or please call us at 1-561-640-1090.